The Tomahawks will now head to the state tournament riding a six-game winning streak. NORTHBOROUGH, Mass. - Entering the fourth quarter of Algonquin’s regular season finale against Mid-Wach A rival Shepherd Hill, it looked like the Tomahawks and their fans would have to wait for the result of the Wachusett-Worcester North game to see if the T-Hawks won an outright Mid-Wach A regular season title. However, Algonquin (14-6, 7-1 Mid-Wach A), bounced back from a 50-43 deficit at the start of the fourth period to out score Shepherd Hill (5-14, 1-7 Mid-Wach A) 23-8 over the final 8 minutes. The T-Hawks would go on to pick up a 66-58 victory on Wednesday night at Algonquin Regional High School in Northborough, clinching the Midland-Wachusett A regular season title in the process. Algonquin head coach Brian Doherty said that the key to the Tomahawks’ fourth-quarter turnaround was their defense and rebounding. Both defenses had trouble slowing down the opposing offenses in the first quarter. The teams turned the game into a track meet, going up and down the floor, making layups and earning trips to the foul line. The two teams went back and forth until the Tomahawks went on an 8-0 run that gave them 22-16 lead. Algonquin junior Kyle Henderson (15 points, 4 rebounds, 3 assists) had six points over that span. Two free throws and a basket by Shepherd Hill junior Jason O’Regan (16 points, 13 rebounds) made the Rams’ deficit 24-20 at the end of the first quarter. The Rams dominated play in the second period, as they outscored the host Tomahawks 16-3. O’Regan and senior Paul Veronis (team-high 17 points) led Shepherd Hill on offense. Shepherd Hill also won the turnover battle in the second quarter, collecting steals on passes by the Tomahawks while taking care of the basketball on the offensive end. The Tomahawks’ halftime deficit was 36-27. Veronis picked up right where he left off at the start of the third quarter, drilling a 3-pointer ten seconds into the second half to put the Rams up 39-27. After the teams exchanged baskets, Algonquin went on a 6-0 run, headlined by three free throws by Henderson that cut the Rams’ lead to 43-37. Shepherd Hill extended their lead to nine points on a three-pointer by junior Kenneth Flynn. Algonquin responded with a midrange jumper that was banked in by senior Dustin Branson, who finished with 10 points and 5 boards. The Tomahawks began the fourth quarter on a 12-0 run. Algonquin played with more intensity on both sides of the ball in the fourth period. They looked to force a turnover on every Shepherd Hill possession. Henderson drove hard to the basket, and their forwards went up and fought for every rebound. Henderson also demonstrated his passing ability down the stretch, twice setting up sophomore Nick Redden (team-high 16 points, 14 rebounds) for a layup and then a baseline jumper that gave Algonquin a 55-50 advantage. Senior captain Brett Sherman (8 points) made a basket to put the T-Hawks ahead 57-50, and then forced a steal on Shepherd Hill’s ensuing possession. The Rams were not done yet, however. A three-pointer by Michael Gilligan that cut Shepherd Hill’s deficit to 57-53 occurred in between Algonquin’s two leading scorers, Henderson and Redden, fouling out. Henderson picked up his fifth foul with 3:35 remaining, while Redden was whistled for his fifth personal foul with 2:30 remaining. The T-Hawks demonstrated their depth over the final few minutes, as Sherman and sophomore Brian Duffy (10 points, 6 rebounds, 2 steals) made shots to put the game out of reach of the Rams, even with Algonquin’s lead ball handler, Henderson, out for the remainder of the contest. Coach Doherty said that his team has multiple scorers, and that the T-Hawks do not depend on one player to score. “We have a well-balanced attack,” Doherty said after the game, adding that multiple players, such as Branson, Duffy, and Sherman, stepped up against Shepherd Hill. 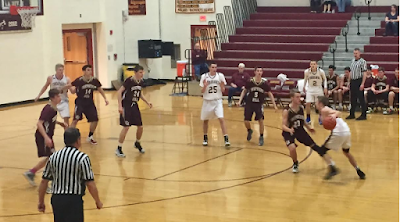 Algonquin has come a long way since losing three of their first four games. Coach Doherty said that Algonquin’s Mid-Wach A regular season title shows the growth and maturity that his young team displayed throughout the season. Wednesday’s game was far from Algonquin’s best. They turned the ball over and struggled to find a rhythm on both sides of the ball until the fourth quarter. However, the T-Hawks showed the ability to make in-game adjustments, and they found a way to win despite not playing their best. The Tomahawks will now wait for the tournament bracket to be released on Friday. Regardless of who they play, Algonquin will come in riding a 6-game win streak, including ending St. John’s (Shrewsbury) 12-game win streak. The T-Hawks are a team that has improved as the season has progressed and that is playing well at the right time of year. Led by the dynamic scoring and passing ability of Henderson, along with other players who can put the ball in the basket, the T-Hawks could surprise the state and bring a championship to the Boros.